The purpose of this chapter is to examine the limitations of our current political structures in incorporating the cosmopolitan principles that may be emerging in the normative developments of our global order. The perspective that I take is explicitly cosmopolitan, although it is elaborated out of an exercise of immanent criticism from within our existing institutional order. This analysis confronts spaces of the incipient articulation of cosmopolitan realities with political models of international legitimacy. This scenario constitutes an example of the incapacity of national state democracies to give a proper account of their foreign duties through national or supranational institutions. We briefly examine two emerging political sites that partially realize cosmopolitan realities in defiance of the national system. The first case is the political space of our metropoleis and their distinctive disposition towards refugees in Europe. 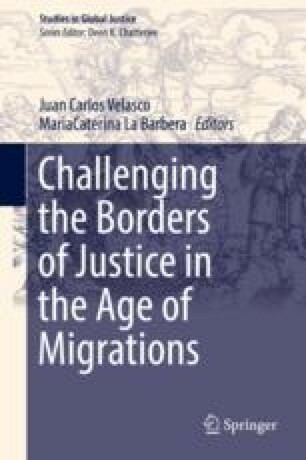 The second case is the emergence of a cross-border network of urban connectivity and the alternative characterization of the refugee flows as a constitutive part in this transnational social fabric. Blake, M. 2016. Philosophy and the Refugee Crisis. What are the hard Questions? The Critique. [Especial issue –And Who is my Neighbor? Immigration, Human Rights and Sovereignty http://www.thecritique.com/articles/philosophy-the-refugee-crisis-what-are-the-hard-questions/. ———. 2016. From Right to Favor. The refugee Question as Moral Crisis. The Nation. https://www.thenation.com/article/from-right-to-favor/. Gibney, M. 2016. Liberal Democratic States and the Problem of the Refugee. Why Do Liebral Democratic States maintain a Commitment to the Institution of Asylum? The Critique. [Especial issue –And Who is my Neighbor? Immigration, Human Rights and Sovereignty http://www.thecritique.com/articles/liberal-democratic-states-the-problem-of-the-refugee-2/.